Click to download the formal invitation. 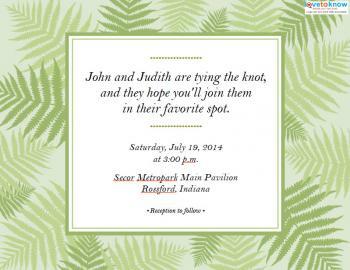 Free printable invitations for your wedding can be customized to say exactly what you want. Many couples prefer printable invitations as a way to save on wedding expenses without sacrificing a professional-looking design. The type of wedding invitations you send out should match the style of wedding you plan. Couples typically choose to have either a formal wedding, an informal ceremony, or a very casual-style wedding, and the basic invitation wording varies a bit for each one. The invitations offered here represent the various styles, and you can download the invitation of your choice using Adobe Reader. 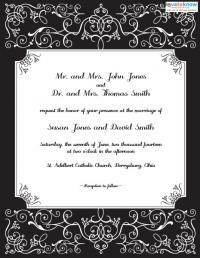 Customize the wording with your personal details, and print your invitations on heavy cardstock for a professional look. 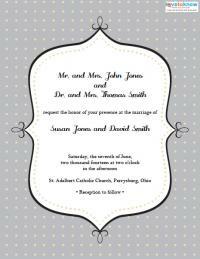 The elegant designs and script font found on these invitations will set the tone for a formal wedding. The wording reflects a traditional ceremony where the parents of the bride and groom are involved with planning and holding the wedding and reception. 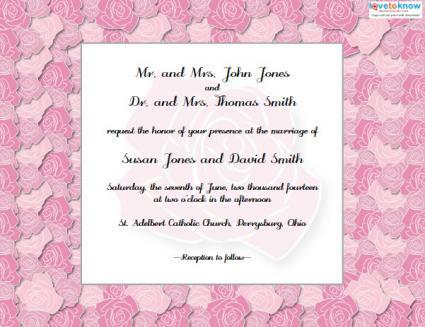 The wording and pretty tulip image on this informal invitation works well for a less formal ceremony where the bride and groom are throwing the wedding themselves. Click to download this wedding invitation. A light-hearted verse immediately sends the signal to potential guests that the ceremony and setting will be casual. The fern background is especially ideal for an outdoor wedding. RSVPs and reception details are traditionally printed on separate cards, and both can be enclosed in your invitation envelopes. RSVP information: Your RSVP wording should include the date it is due by and include a phone number or an address to mail the card to, as well as a space to fill in the response. Reception card information: The reception card should include the name of the venue, the complete address, and simple directions or a map from the ceremony site to the reception if it will be held at a separate location. The Internet is the primary resource for free printable invitations. Quick resources to consider include the following options. Greetings Island offers free invitation templates which you can download, customize, and print at home, and they have many beautiful designs to choose from. 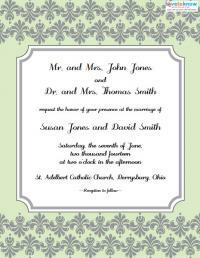 Ribbon scroll invitations are available from Paper Alchemy. This design offers an unusual scroll presentation that is tied with ribbon and delivered in colorful postal tubes. 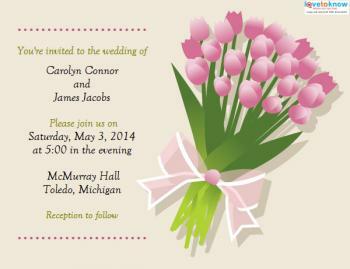 Hoover Web Design offers six pages of printable invitations. Designs include images of flowers, cakes, and champagne bottles. Affordability is perhaps the most obvious benefit of creating your own wedding invitations, but that doesn't mean you can't have lovely invitations just because you didn't purchase them from a professional printer. You can explore several options for very little cost, and free downloads provide access to a wealth of designs that cater to specific tastes. Current wedding trends embrace personalization, and creating your own invitations offers a wonderful way to make your occasion truly unique.